Most people, at some point in their lives, will go through some financial trouble. It is nothing to be embarrassed about – it is just a fact of life that at some point you just might be flat broke. 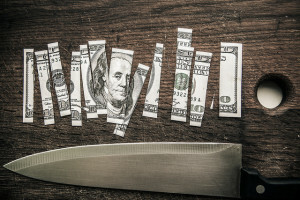 When you find yourself facing a situation where you don’t have enough money coming in to meet your bills on time each month, the first thing you should do is look for ways to save. Even the most responsible people usually have a few places where they can save money just by making smart decisions and planning ahead. Here are six easy tips designed to help you save where you can until you get back on track. When money gets tight, meals out of the house should be one of the first things to go. Cooking your own food is almost always less expensive than eating in a restaurant, and it is often healthier as well. If you don’t know how to cook, learn some basic skills and you just might find that you enjoy the hobby of cooking – in addition to enjoying the money that you can save. Do you really watch all of those channels you pay for? Call your cable company and see if you can reduce the cost of your monthly cable bill by cutting out some of those extra channels. Most likely, you won’t even miss them once they are gone. Putting miles on your car costs money in a number of ways. Obviously you have to put gas in the vehicle, but you also need to perform maintenance more regularly when you drive a lot of miles. While there might not be anything you can do about your commute, try to keep the non-work miles to a minimum. You might not think it’s a big deal to leave some extra lights on or let the furnace run while you aren’t home, but those energy costs can add up quickly. Make sure you are keeping your utilities bill to a minimum by turning off lights when you aren’t in a room, programming your furnace properly for the times when you need it to run, etc. These are simple fixes but the savings can add up and saving energy is good for the environment as well. If you need to replace some of your clothes, consider browsing the second hand store for low-cost options. Many of the garments you will find in these kinds of stores are in nearly-new condition for a fraction of the price that you would have to pay otherwise. For some people, it is a morning stop at a coffee stand. For others, it is an afternoon trip to the vending machine at work. Whatever your daily habit happens to be, it is probably costing you more money than you realize. Try cutting out this daily routine and see how much money you can save over the course of a week. Once you see the extra money start to add up, you likely won’t have any interest in returning to your old ways. Have you used any of these ideas to save money? Have you ever negotiated a bill? What are some other ways you can quickly cut your spending? Cooking for yourself is an easy way to save money money. You can pick up a handful of items to make a basic meal for cheap. And depending on the size of your family, you can have leftovers too. Completely agreed Jon. We rarely eat out any more and it saves us big money. I love cooking at home, I used to have a lunch out every weekend with my family, but now I tried to cut it less to 1 or 2 times per month. When I decided to get rid of our cable connection, I can say that I definitely save money from it. We’re looking seriously at cutting our cable – I want that extra money in our budget to do other things. We have been cooking at home for some time now. We can make bigger portions to cook at one time and then take the leftovers for lunch! It’s healthier, fresher and doesn’t have all the preservatives either! As far as cable goes, we have Netflix and rent/buy a movie every once in a while from the Google Play Store/Apple iTunes. We don’t really watch that much TV to begin with though. When we first moved into our house 5 years ago, we installed CFL lights throughout and also installed a newer programmable thermostat for $25. We watch our usage every month and try to make it into a game to get it down. Sounds like you’ve got things humming along pretty good there Steve. There are many ways to save, if you’re willing to put in a little work. I’d definitely add DIY to the list. With all of the resources on the internet these days it’s amazing the number of projects that you can do yourself. Saves a ton of money and you typically learn a lot in the process. Great point Dane! I’m not the most skilled when it comes to DIY on things around the house but have been to save a significant amount of money teaching myself certain skills – all thanks to the internet. Another way to save is to do your grooming services at home. I save about $250/month, just by waxing my legs & eyebrows and washing & styling my hair at home. My fiancé cuts his own hair which save him $40/month. It took so practice, but it was the best decision I have ever made. We do that as well Sylvia. I don’t think I’ve paid for a hair cut in close to 20 years. Thomas @ i need money ASAP! Oh gosh. I used to be really bad with money. At one point I had to give up drinking all together (alcohol). That seems like an easy thing to do until you realize how much of your social life revolves around drinking (at least for me at that time in my life). It wasn’t easy. Lots of peer pressure to drink. It saved me a ton of money though! I have done these all. But, the food, I saved much money on food. I rarely ate out during those moments when I was broke. I brought my packed lunch to work. Aside from these, I think sacrificing gym membership is another way and would test most of the guys out there if they could sacrifice this one for them to reach their financial goals.